What towns/states are y'all from? I am from Superior, Wisconsin and he is from Bigfork, Minnesota. What did you do on your first date? I drove to Bigfork, and we met at his family's restaurant for lunch. After that we went to his house and talked for hours....then I ran away! When did you know that he was the one? I knew we had something special the first time we met in person. But I got scared, and ran away for about 2 weeks, (which he LOVES to remind me of....lol.) Yet he respectfully gave me my space, and that's when I realized that I missed his voice, and our long talks. So when he called me out of the blue one day, I just laid all my cards out on the table telling him how I felt, and he felt the same way too. What is your favorite thing about him? There are many qualities that I love about him. But the one thing I adore is his generosity. He is the most kind and loving person I've ever met. Here at FarmersOnly.com, we love hearing your Success Stories. Sydney and Nathan got engaged in November, 2016 and are planning for their 2018 wedding. In September, 2015, Sydney saw Nathan's profile, liked his profile and sent him a message. A few days later, Nathan liked Sydney's profile and messaged her back. They messaged each other everyday for over a month. In October, they finally met face to face for the first date. We got the chance to catch up with Sydney and learn more about them. What did you guys do on your first date? I was home on fall break, and we decided to finally meet and have our first date. We met at Texas Roadhouse, talked for hours, then headed to a bowling alley for a little competition. I won fair and square but Nathan would said he let me win. The whole time I wanted Nathan to kiss me goodnight. I settled for him asking me on a second date. The second date, I drove to Rankin, Illinois to meet Nathan at work. At the time he was working for a farmer. I climbed up in the tractor and sat with Nathan as he worked. I had a chance to learn to drive the tractor! The second date did end with a kiss. When did y'all move in together? Nathan was living in Illinois with his lease on his apartment ending before the New Year. He decided to move closer to me. He packed up his belongings, rented an apartment in Wisconsin and was ten minutes away from my school apartment. I found myself living at Nathan's apartment instead of mine. In May of 2016, we finally moved in together. A few weeks before our 1 year anniversary, I asked Nathan what he wanted to do for the anniversary, his response is "I am busy, I am meeting your parents for lunch, you are not allowed to come with." I knew that something was up when he told me I couldn't have lunch with my parents. A week later Nathan asked me what I was doing over the next weekend. I didn't have any plans, so he told me he wanted to go to Illinois for the weekend. We drove to Illinois and stayed at my parent's house. The morning of our engagement, I was determined to go get a new phone. I was at Best Buy when they opened and got myself a new phone. When I got back home, Nathan was dressed in a blue button down dress shirt and told me to get in the truck, because we had places to go. Nathan drove me to Perry Farm, where we met up with Dawn and Craig (Nathan's parents) who were in town from Texas. We all start walking down the trail. I noticed Nathan was walking behind me instead of next to me like he always does. I always walk fast, so I was five feet in front of him. I heard Nathan call my name, and I turned around and he is down on one knee. He asked me to be his wife, and of course I said YES. Our wedding is planned for June 9, 2018! Ashley and Steve met on FarmersOnly.com in 2009, and they're getting hitched in October! Steve (New Richmond, Wisconsin) and Ashley (Lake City, Minnesota) met January 1st, 2009 through FarmersOnly.com. Ashley sent us the sweetest note about how her and Steve started talking and how their relationship progressed - He sent me a message on FarmersOnly.com. He didn't have much for a profile and no pictures. We talked for two weeks on the site and then we exchanged emails and talked for another two weeks. Finally, after a month of talking online, we exchanged phone numbers.... we talked and texted a lot. We lived about an hour and 10 minutes from each other. He lives on his family dairy farm. I was living on my mom and step dad's hog and crop farm. February 12th, 2009 he showed up at my work, I worked at a convenience store at the time. Mind you I did not know what he looked like and we have been talking for a month and half at this point. You know your customers and regulars very well. I looked up as I was doing inventory counts and I knew it was him. Nervous as one can be to meet this guy. I was in the middle of counts and my shift was almost done... I was doing my best to keep count and talk to him. He said "well, now that you know what I look like would like to go out with me on Valentine's Day?" I said "yes, I would love to go out with you". He got me 24 long stem white and pink roses. I was so nervous being with him and giving him my all. I had been single a year from a very damaging relationship. Took me a few dates, weeks and months to begin go trust him and see the love he had for me. We had a simple first date. We ate at Perkins in Red Wing, MN and many more after that. I fell in love with from the inside out. We were together about a month. I lost my uncle unexpectedly. He drove an hour and 10 mom south after milking cows and doing his chores to hug me and say I am sorry for you losing your uncle and I love you so much hun. It was the first time he had said I love you and I knew he meant it. I could see it in his eyes that he loved me. I love his soul, his love for animals, his corky grin, his love for his family, his love for me, his love for the family, his farm, I could go on. I love how he looks at me and I can see he loves me through and through. I wouldn't trade it for the world. Congratulations on your love Ashley and Steve! We wish you all the best in the future! 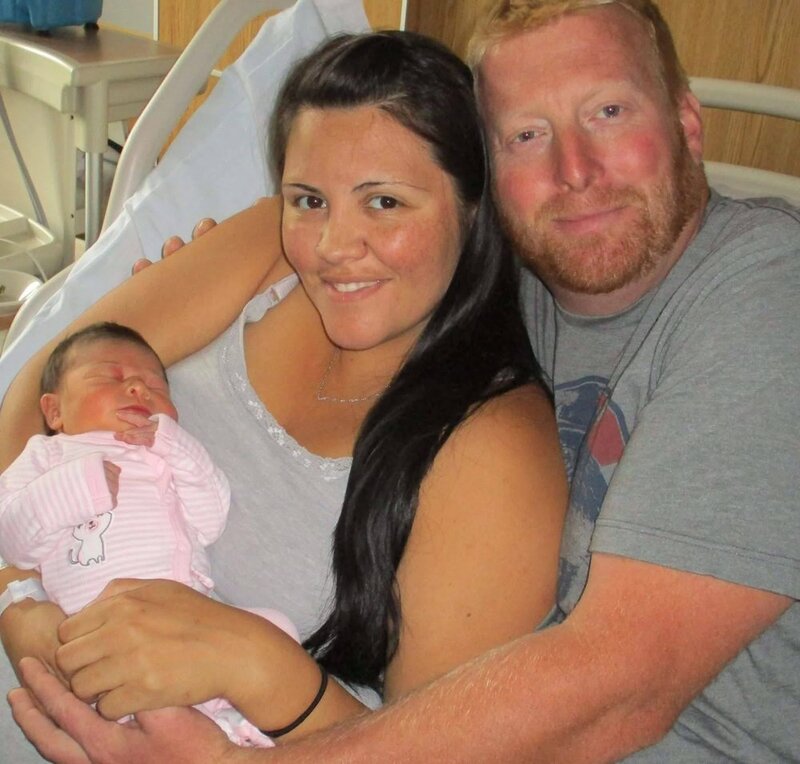 Patricia and Eric have added an adorable plus one to their farm! Eric (Milton, Wisconsin) and Patricia (Arena, Wisconsin) met on FarmersOnly.com and knew they were meant to be! They have the cutest little girl, Raelynn Ann. Patricia is the farmer out of the pair of 'em, but he's a country boy at heart. We talked with Patricia a few weeks ago to learn a little bit more about their sweet story. On the first date we went to the Great Dane for dinner, and then to the movies. On our second date, we went fishing. How did you know that Eric was the one? I knew he was the one when he went up to Northern Wisconsin to deer camp and I missed him so much I couldn't wait to talk to him and see him again. What do you love most about Eric? That he didn't care what people thought and that he is very close to his family. And his blue eyes! Ready to be a FarmersOnly.com success story? Get signed up today! You don't have to be lonely at FarmersOnly.com. I have met my new lifetime partner, thank you FarmersOnly.com. I was a short time member of Farmers Only last year and met the most wonderful, loving woman of my life on your site. Ironically, she and I had both just cancelled out memberships when we connected mentally. We are both blissfully happy and eternally grateful for your service. Personally, I am amazed at the connection we made. We are now a lifelong item. Farmer's Only WORKS!